Francesco Botticini (Francesco di Giovanni di Domenic), Florentine painter. 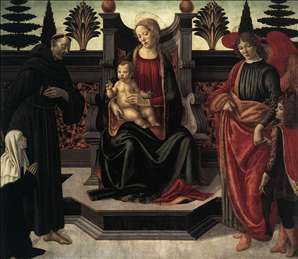 The son of a painter of playing cards, Botticini was apprenticed in 1459 to the successful Florentine painter Bicci di Neri. From 1471 he was a meber of the Confraternity of the Archangel Raphael at Santo Spirito, and in 1472 he was inscribed in the Confraternity of St Luke. 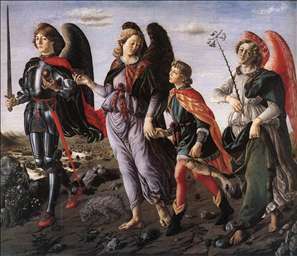 His style consists almost entirely of elements drawn from his more illustrious contemporaries - Sandro Botticelli, Domenico Ghirlandaio, Filippino Lippi, Andrea del Verrocchio. He painted one remarkable work, however, the Assumption of the Virgin (National Gallery, London, c. 1474), which has the distinction of being the only picture from the Quattrocento known to have been painted to illustrate a heresy. The donor, Matteo Palmieri, believed that human souls are the angels who stayed neutral when Satan rebelled against God. See more details about "The Three Archangels with Tobias"
See more details about "Virgin and Child Enthroned"